Project Bona Fide is a 26-acre demonstrative farm and experience-based learning center that promotes food security and sustainable living systems on Isla de Ometepe, Nicaragua and throughout the larger bioregion. Using permaculture design, agroforestry, research, education, and community collaboration the project has grown to completely transform the landscape, form strong community ties, and share their work with thousands of people from around the world. Beautiful views of Ometepe in Nicaragua. Since its inception in 2001, Bona Fide has functioned as a living seed bank by researching, planting, and protecting a diverse variety of trees that provide seeds for future restoration, reforestation, and experimentation efforts. Trees planted on their site in the town of Balgue are studied so that Bona Fide can continue to identify species that function well in the environment, require little to no inputs, and will provide beneficial outputs to their neighbors on Ometepe. Chris Shanks, the agricultural director of the project, has led these efforts by searching for key species across plant genera and analog climates since the farm’s beginnings. Additionally, Bona Fide employees and community members make a concerted and continual effort to collect, dry, and distribute seeds of economic and food security interest to the general public of Nicaragua. This is accomplished via strong relationships within the villages where they work, their annual seed and plant exchange, and plant sales to international clients. Every year in April or May, just before the planting season begins, Bona Fide holds a Seed and Plant Exchange at Mano Amiga, the local community center. People from Baglüe, and the island of Ometepe at large, are welcome to come exchange whatever they’d like, except money, for seeds and plants from the farm. It’s the biggest annual push to get valuable genetic material into the hands and backyards of the public. The exchange also serves as an educational space to hold a variety of food and agriculture related workshops. Since the project’s inception, they have held 7 official seed exchanges and have spread over 10,000 seeds and plants to the local community. Generally, Saturdays on the farm are pretty relaxed, giving volunteers, interns, and the staff time to run errands on the island, make strides in their latest read, enjoy an awesome meal in town, and rest their hard-worked bodies. However, on the Saturday of the Seed Exchange this May, Bona Fide folks were up before the sun rises; watering the garden, preparing breakfast, feeding the chickens, and getting all the necessary goods organized to walk to town for the start of the exchange. Like many years before, the first two hours of the exchange were the busiest. Neighbors and friends hustled through the brightly painted gates of Mano Amiga, bounty in hand, to see what the farm had to trade. 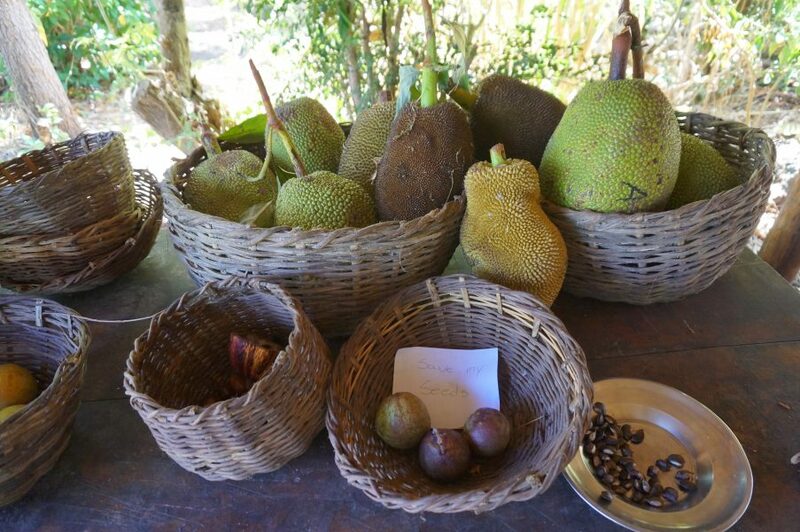 Bona Fide staff greeted the crowd with in-season treats like starfruit, suriname cherries, jackfruit and lacto-fermented veggies as they made their way to the collection of trees and seeds awaiting them. Seed exchanges are crucial to keep the fruit varieties growing. Save your seeds! Some plants, like bamboo, jackfruit, and the miracle fruit, are now well known in town and “flew off the shelf” within an hour from the start. As the morning continued, crowds of people gathered around the assortment of trees and seeds, asking about less familiar varieties and bartering their goods for the plants they wanted to take home. This year, Amanda and Sara, both Educational Coordinators at Bona Fide, set up shop in the corner to give out samples of their fermented veggies and explain the fermentation process and benefits to curious passersby. A giant, freshly harvested Jackfruit was also displayed. By midday, crowds had slowed and the BF team and a group of local kids, exhausted from a few back to back pick-up soccer games, headed over to the kitchen area to wack down a few piñatas and indulge in an afternoon snack. Doña Jaqueline, the owner of a mill in town and an excellent baker (many Bona Fide birthday cakes have made their way from her oven to the farm), was one of the last to come trade for a few trees before the team packed up the bags of grains, fresh fruit and vegetables, and handfuls of precious seeds that were exchanged during the day. With hundreds of seeds and plants on their way to new homes, the team headed back to the farm, satisfied from a full day’s work. 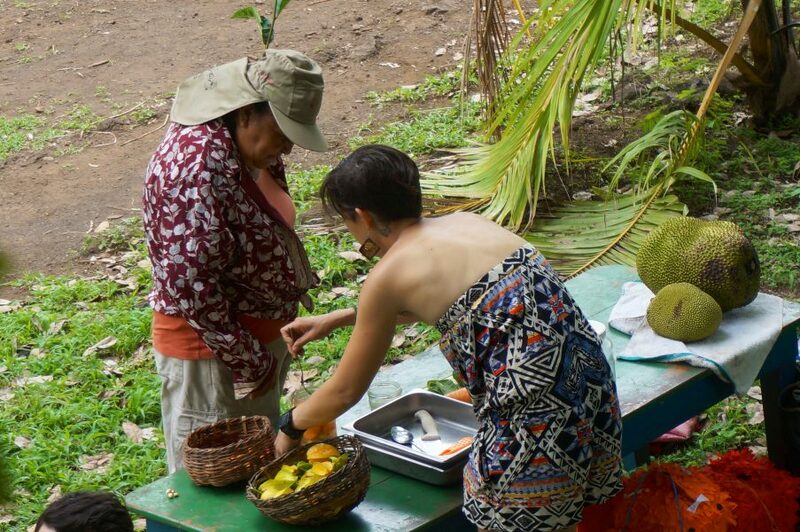 Project Bona Fide passes out samples of fermented veggies at Mano Amiga, local community center on Ometepe Island. Since the project began this journey, they’ve seen an increased interest in different plant varieties, biodiversity, and alternative agricultural techniques, especially amongst the 15 local employees who manage the farm’s systems year round. After 14 years of growth, Bona Fide now takes advantage of more mature and robust tropical food systems, seed production, and an expanded nursery to reach far beyond the island of 40,000 people with their edible, medicinal, and multi-use plant introductions. They hope to continue re-introducing and educating the community on biodiversity to support rebuilding ecologies and economies that can feed and nurture communities supporting them for decades to come. Children from the island in Nicaragua learn the importance of planting trees. Living and learning at Bona Fide, you will join a community of devoted individuals in their pursuit of fostering regenerative land use systems and sustainable lifestyles. You can expect to participate in a wide range of sustainable lifestyle and agriculture courses, partake in a local adventure, eat organic farm-grown food, take in some incredible volcano vistas, and build strong relationships with fellow volunteers and local staff. Project Bona Fide is holding a Permaculture Design Course August 2nd-15th with a special emphasis on forest gardening in the tropics. Bona Fide’s PDC is a 2-week hands-on training in permaculture design principles and practices that is ideal for anyone interested in taking an active role in building a regenerative future. At the end of the course, all participants will receive a certificate of completion of 72 course hours plus 20 additional hours of skill-building workshops and hands-on experience. Don’t miss out on this opportunity to learn from exceptional staff and an ever-evolving site on the incredible Isla de Ometepe!